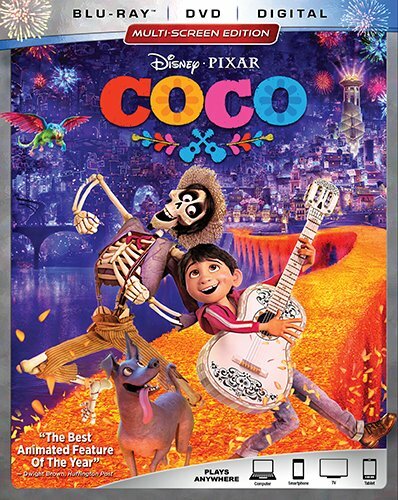 Disney•Pixar's COCO is now available on Blu-ray and DVD. There are many extras, including deleted scenes, music videos, filmmaker commentary, and trailers. I can't quite remember which movie I watched in theater, but I recall seeing a preview for COCO before that film. In all honesty, it didn't pique my interest. When I received the film for review, I thought I'd give it a shot. Boy, I'm glad I did! The animation is fluent and expressive, while the story line is meaningful and flows so well. COCO tells of a tween boy named Miguel who lives with his grandmother, Coco, and her descendants. Miguel has dreams to become a musician but, for reasons told in the movie, there's a ban on any and all music. This doesn't stop Miguel from rebelling and practicing music in secret. When Miguel steals a guitar, he becomes a ghost that only the returning dead can see. Miguel is then taken to a place where the dead dwell but he has to hurry up and find a way to get back to the land of living before he becomes part of the dead himself. While there, he meets some quirky characters and has to turn a wrong into a right. This film is intended for kids but adults will delight in it as well. We just saw this over the weekend and LOVED it. Cried and cried at the end. I saw this with my 9 year old granddaughter and we both loved it. Such a compelling story with great music. I haven't seen the movie yet but thanks for the review, I now know what to expect....though, it does look like a charming movie. I would like to see this DVD with my nephew...I think he would really like this a lot. Sounds like a great one to add to the collection! I missed this one when it was in theaters. I just purchased it on Blu-Ray and the picture is amazing. This movie makes me want to upgrade to a 4K TV it was visually stunning.